In the 2011, the Sri Sathya Sai Primary School completed 30 years of yeomen service to the society. Established by Bhagawan Sri Sathya Sai Baba in the year 1980, the Primary School at Prasanthi Nilayam has been a pioneer in imparting value based primary education. It has given thousands of students the glorious opportunity of living under the umbrella of Bhagawan's divine motherly love. 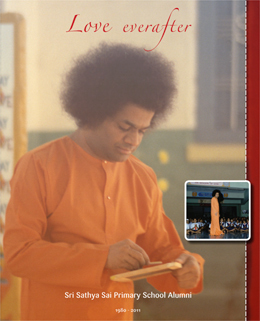 To mark the 30th anniversary, and in a humble way document their feelings of gratitude and love for their beloved Lord and their alma mater, the alumni of the Sri Sathya Sai Primary School brought out the book, 'Love everafter' - a volume compiling articles from former students from the various batches. The articles posted here on this webpage are two articles from this book. Mr. Akhilesh Patel was born in Swami's General Hospital in Whitefield, Bangalore in 1979 and went on to study at the Sri Sathya Sai Primary School in Puttaparthi from 1984 - 1990. He is now based in London as a freelance cameraman, working regularly with news organisations like Al Jazeera English, BBC and APTN. And when in Puttaparthi, he volunteers for the Prashanti Digital Studio. He has had the good fortune of filming Swami during various festivals in Prasanthi Nilayam, such as Shivratri, Dussera, Baba's Birthday, Ramnavami, Krishna Janmasthami, Sports Day and during various Darshans from 2008 to 2011. I studied in the Sri Sathya Sai Primary School between 1984 and 1990. It was barely a few years since the school had been established and the atmosphere was still informal. For years we addressed our teachers as sisters rather than madam. We’d be reprimanded by Headmistress Aunty or Warden Aunty for climbing a tree, who then in the night would come by our bedside to apologise and lovingly put us to sleep! Our teachers treated us like their own children as many like me were homesick and missed our parents. Pictures taken during one of the many visits made by Baba to the Sri Sathya Sai Primary School. (Right) Akhilesh is seen taking Namaskar. Swami would come to school so often that a visit by him was hardly considered earth-shatteringly newsworthy. Back then there were no photographers trampling over each other blocking everybody’s view or a posse of security men shoving aside anyone trying to get close to Swami. Bhagawan merely dropped by to spend time with His children. And we took it for granted that Swami will turn up at school for the most mundane things. There were students from all over India, some even came from abroad. Hence, the prevailing culture at school and in the dormitory was both global and local. This was reflected in the food at our hostel - rice, rice and more rice! Anybody familiar with India will know that south of the Deccan plateau food habits change drastically - rice replaces wheat. And Puttaparthi being in the south is a overwhelmingly rice-eating country. My life at home was an intercontinental hotchpotch of influences: East Africa, England and its literature, Gujarat and Whitefield. And food habits at home were most definitely not south Indian! To an eight-year old boy who did not like rice, there was only one recourse: moan about it to my mother during parents visiting hours. What my distraught mother was going to do about it, I had no idea. One day during Darshan, Swami came up to us and started his usual chat with us children. These sessions regularly involved questions such as: What did you have for breakfast? How many Idlis? What is your name? Where are you from? Which class are you studying in? etc. During one such session of His usual banter with us, He called me out and told Warden Aunty: ‘His mother in Gujarat is worried about his diet as he doesn’t like rice. So give him more chapattis instead’. Swami then patted me on the cheek and continued with the rest of the Darshan. My mother, of course, had never physically gone up to Swami and complained. She had only silently prayed to Him. The irony of this is that now I absolutely love eating rice and consume unhealthily copious amounts of it! Partish was a student of Sri Sathya Sai Vidya Vihar, Nandanavanam, Ootacamund from 1978-1983 and Sri Sathya Sai Primary School, Prasanthi Nilayam from 1983-1985. 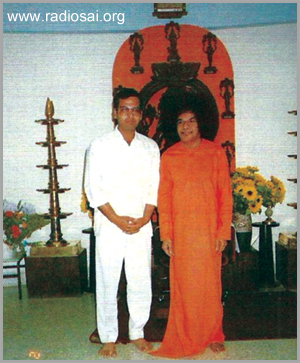 He completed his Higher Secondary education from Sri Sathya Sai Higher Secondary School in 1990 and graduated with a Bachelor of Science degree from the Brindavan Campus of the Sri Sathya Sai Institute of Higher Learning, He further went on to complete his postgraduate MBA degree from SSSIHL in 1995. He has also won two all india level Essay writing Competitions. He Currently works as an Asset Manager with Capital Asset Service Limited in the City of London. He is the Spiritual Coordinator at the East London Sai Centre and has had the privilage of speaking on Bhagawan at various centres and regions in the United Kingdom. Sri Sathya Sai Vidya Vihar, Nandanavanam, Ootacamund was inaugurated on 9th Feb 1978. Bhagawan had sent Dr. S. Bhagavantam for the inauguration. Our School was situated on a hill top and we had two playgrounds. We addressed our Principal, Mrs. A. K. Verma as ‘Mother’ and our teachers as ‘Sisters’. Did I really miss home? My memory of those early days is that I enjoyed being at School. We all conversed in English and on Bhagawan’s instructions we wrote letters to our parents every week. An incident my parents have repeated many times over the years is one that occurred at the end of the first term. As parents came to collect their children from school, Mother told them, “Today, I feel like how you felt when you left your child in February.” Mother treated us all like her own children. Whenever a parent visited the school and brought some eatables for their children, Mother would gently inform the parent that they should give eatables to all the children at School and not just their own. In this manner, a sense of sharing and caring was inculcated in us. We used to do meditation for 15 minutes every morning from 08:00 am to 08:15 am. Warden Aunty would ask us to look at Swami’s photograph and then close our eyes. Gradually, she would guide us to bring Swami’s image before us. She would talk us through the entire process. I remember we all loved the meditation sessions. It helped us internalise Bhagawan every day. In my second standard, we were fortunate to have our classroom next to Bhagawan’s room in Ooty. This was the room the chosen Brindavan boys stayed in when they visited Ooty with Bhagawan. As the intake of students grew, Bhagawan constructed another school building and a third playground for us. In our fourth standard, a Ganesh temple was constructed on the second playground. It was on this playground that Bhagawan had taken individual photographs with all of us a few years earlier. We were all very small and had the unique privilege of Bhagawan putting his arms around us. This photograph has a unique significance in my life. Mother narrated this to my parents when she handed over the photograph to them. I was down with measles and had been moved to the sick room. Mother was worried and prayed to Bhagawan in her shrine whether she should keep my parents informed. Soon she received a message that Bhagawan would be visiting Ooty the next day. During that visit, He decided to take photographs with each of us individually. We were all dressed in our school uniforms for the photographs with Bhagawan. 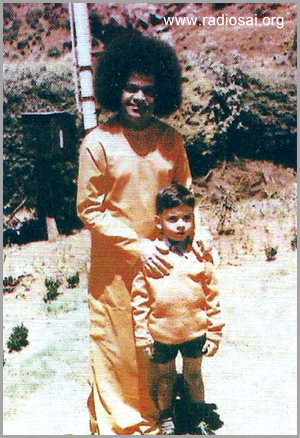 Mother informed Bhagawan of my sickness, but He commanded that I too should wear the school dress and shoes and be brought for the photograph session. After the session, I joined the dormitory instead of returning to the sick ward. I had been cured by the touch of the Lord! This was my first direct experience of Bhagawan’s Divinity.